Ahead of a crucial primary in Pennsylvania, Democratic presidential candidate Hillary Clinton said if she were president and Israel was attacked by Iran with nuclear weapons, the US would "totally obliterate" Iran. "In the next 10 years, during which they might foolishly consider launching an attack on Israel, we would be able to totally obliterate them," Clinton said in an interview for ABC's Good Morning America. 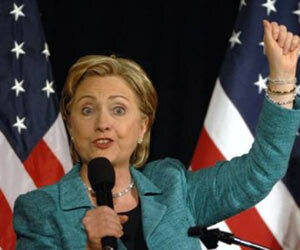 Clinton's opponent Barack Obama accused her of sabre-rattling, saying this was the kind of language that had been used by the Bush administration over the last years. Iran does not have nuclear weapons and insists that its uranium enrichment programme, which sparks Israel's fierce protests, is purely for civilian purposes.